Holy Week is upon us. And you, like most Catholics, want to enter into the passion, death and resurrection of Jesus. But you’re not like most Catholics. 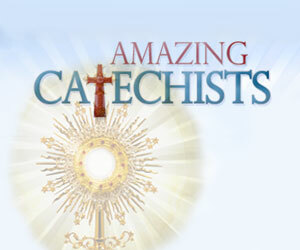 You belong to that special group who have chosen to serve the Church by working in a parish. And sometimes this week is difficult to enter into because you have so much work to do. I’ve been there; actually, I am there. 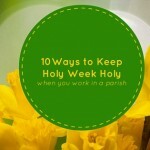 But I’ve learned a few things on how to have a holy Holy Week. The best way would be to go on retreat or leave town. That is usually not possible, if you work with the RCIA group, direct the choir, serve as the lone sacristan, or are the liturgical coordinator. Here are ten tips that can help and are doable! 1. Plan ahead as much as possible. This means not only for the parish but for yourself and family. Have all your clothes chosen and ready for each liturgy. Keep the calendar as up to date as possible, noting the time you need to be at church–not when an event or liturgy begins. Line up any childcare ahead of time. And ladies, wear comfortable shoes. Smiling is hard if your feet hurt! 2. Spend extra time in prayer. But probably not at your parish: outdoors, at home, at another parish church–where you can be there and no one will need you to help with “just one thing for just a minute.” If possible, go to a neighboring parish for Mass that week. Allow yourself to be in the presence of God without worrying if everything is getting done. 3. Buy your favorite spring flowers, the ones that say “Easter” to you and put them on your desk and in your home. 4. Make sure you sleep and eat. Don’t rely on caffeine to get you through a non-stop Easter morning. By the noon Mass you’ll be a jittery mess and, like shoes that hurt, it makes it more difficult to be welcoming and calm. 5. Don’t host Easter dinner at your house, unless your spouse and children are willing to do it without your help–or you are serving Chinese takeout. 6. Something will go wrong and you just need to roll with it. One year, the lector for Holy Thursday forgot he was the lector. I saw him sitting in his usual pew and wondered why he was getting up. I couldn’t get his attention, so I had to read. At the same mass, the usher started taking up the collection while the priests were getting ready to wash feet. Lessons learned: Be prepared to do whatever is needed; remind people of the plan before you begin because no matter how many times we’ve done it, we are only human. That was also the year the altar server never took up the bowl of soapy water so the priests could wash their hands after washing feet. 7. If it is not absolutely necessary for you to be at church, don’t go unless you have the time and energy and your family will not suffer. While it may be nice to be present, ask yourself who it serves before you go. 8. Attend Mass with your family. If you are “working” at the Mass, have your family sit where you need to sit or as nearby as possible. 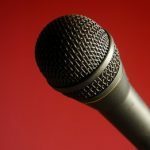 If you are the choir director, try to sit with your family during the homily–if you can do so without calling attention to yourself. 9. Make time for your family traditions. You may need to arrange your family egg hunt on Easter Monday, but better on Monday than with a tired parent on Sunday. 10. And remember, we serve in the parish; but it’s Jesus who saves us all. May you have a Blessed Holy Week!